When it comes to customizing the appearance of your commercial building or retail shop, many opt for glass and aluminum doors. Making the switch from traditional door to a sophisticated glass and aluminum door will improve the aesthetic appearance of the retail or commercial establishment. With emerging trends, the recent boom of storefront remodeling has many local businesses investing in building improvements. LYF Construction can help you step into the realm of well fitted glass and aluminum doors. In the business of installing commercial doors and windows for over 16 years, LYF Construction offers professional service and expert craftsmanship. Call (832) 304-6764 today for a free quote. Opting for glass and aluminum doors for a commercial building entrance offers a variety of customizable characteristics and options. Storefront design plays an imperative role in attracting potential prospects. Having a storefront entrance made from high-quality glass framed in aluminum will set your business apart from the rest. Glass and aluminum doors can also be fitted to any size opening, from warehouses to industrial garages to showrooms. 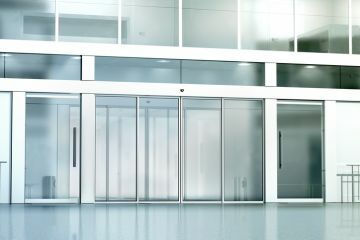 Commercial doors come with a wide range of features, from standard handles and push plates to fully automated closers, access controls, and custom handles. Tell us your goals and budget and we'll find an appropriate glass and aluminum door to suit your needs. Allowing LYF Construction to install your new glass door makes sense. Our door installation experts are highly qualified to work within local building codes and follow installation instructions to keep your warranty valid. They will arrive with the necessary skills to repair and replace all kinds of commercial and industrial grade doors. Allow us to help you by calling (832) 304-6764 today. When looking for a dependable provider of glass and aluminum doors, look no further than the local door and window installers at LYF Construction. Since 2003, we have installed, repaired and replaced glass and aluminum doors throughout the community.